The Greene County GIS Group (GCGIS) provides GIS support to the City of Greeneville and the Greene County government. You can access an application to view maps online. A geographic information systems (GIS) is a collection of computer hardware, software, and geographic data that is used in concert to capture, manage, analyze, and display all forms of geographically referenced information. With that said, another way to visualize GIS is to think of it as a smart map. One in which we are able to associate database information to points (fire hydrants or manholes), lines (street centerlines or water mains), and polygons (parcel boundaries or soil types). This information, stored in a centralized data repository, can then be used to create maps or perform analysis so that informed decisions can be made. The GCGIS was formed in mid-2005 by an intergovernmental agreement between the City of Greeneville and the Greene County government. The purpose of this group is to provide oversight and guidance with regard to developing GIS policies; manage and develop joint fiber optic assets; develop, populate, and maintain a countywide GIS database; and provide analysis and support to all departments within the three governments on integrating GIS within their present workflows. One goal of the GCGIS is to carry out its mission in the most practical, cost-effective, and efficient manner possible. The development of GIS within Greene County is still very much a work in progress. One of the goals of this endeavor is to make certain information available to the public through a web portal. Please check back often to view our progress. You may now access this information online. If you would like to learn more about GIS please visit http://www.gis.com/. 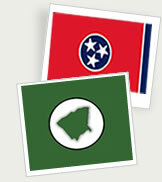 If you would like to learn more about GIS efforts within the State, please visit the following link: http://gis.state.tn.us/.